As Jesus had entrusted a mission to his disciples, we the consecrated persons who are intimately united to Jesus are sent out to proclaim the message of salvation to the people of our time. St. Rosa’s charism “Educate to set free “ had its germination in the soil of Assam in 1986. This mission started in the Parish of sacred heart church in Nagaon in the Diocese of Tezpur ( now Guwahati) under the initiative of Rev. Fr.G.K Prakash ,a diocesan priest, who in course of time became a Salvatorian. 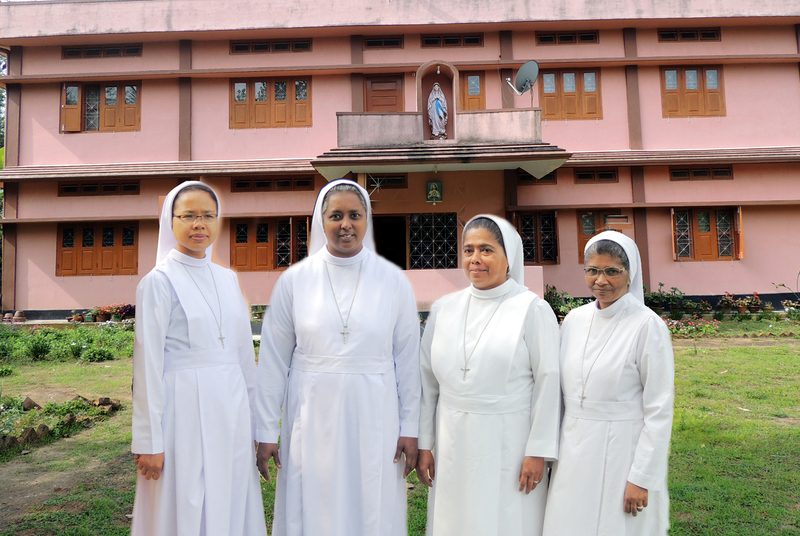 The educative mission of the sisters has its beginning in Christ Jyoti school, which was in its infancy. Staying in a small house adjacent to the parish the sisters started to visit the Christian colonies and gather children for schooling. Every great enterprise has a story of great struggle behind it. Venerini Sisters work in collaboration with the Salvatorian Fathers in Nagaon in every aspects of the educational ministry. The steady growth of this educational institution has become a blessing to the people of North east. Students from other districts too are being educated in this institution. Sisters provide hostel facilities to the girls who join the school or college for their education. Our apostolate branched in to education, Parish work and family apostolate and at present we extended our apostolate in the field of medical care. We make it a point to visit the family of the staff and students of our school as a part of our educational ministry. We join the Christian families to recite rosary with them. This is the first mission station opened by the Indian province. As this mission completes 29 years of its existence in this area, the guidance and the protection of God is very vivid in the field of our activity as well as in our lives. The humble beginning in the parish house and the struggle the pioneers underwent is not fruitless. We bow before the God Almighty for His protection and guidance and believe that He will lead us ahead in the path of justice, truth and love. The vision of the pioneers as well as those who followed them was never blurred. The charism ‘educate to set free’ expresses its concern for total human development in the dispensation of fullness of life for man and society. Knowledge is crucial for human development and it is to be imparted with the tenderness of a mother and the prudence of a father. This vision is materialized as we started a new community in Katiatholi in 1993. It was rather hard to begin the mission since the people belonged to different tribes. Still with the support of theBishop of Guwahati, the young Venerini missionaries started to open the heart of pupils, rather than the mind. With gentle dealings sisters could provide spiritual. intellectual, emotional and moral development to their life styles. At present we take care of the education of the students in St.Thomas parish school, provide hostel facilities for the girls of the distant villages despite of cast creed or faith, teach catechism in the villages and parish and are engaged in youth animation. Village touring programme and family apostolate in the remotest areas of the villages were life taxing. Sisters had to stay in the stilt at night to save their life from wild animals. The sacrifices of our pioneers are rewarded with splendid joy and satisfaction. The grace and blessings of the Almighty and the powerful intercession of our mother foundress lead us ahead to accomplish the task we are entrusted with. Jyothinikethan, A light house for the visually impaired children of north east India. Apostolate for the welfare and rehabilitation of persons with physical and mental disabilities is one of the several ministries of Catholic Church. Maestre Pie Venerini join hand in hand with the mission of the church to spread the message of love through the educational ministry. God’s ways are mysterious. He sends the rays of His projects to the minds of his missionaries and make them listen to the cry of the abandoned.It was in 1994 Mother PieraSilvestrini a woman of great missionary zeal , devoid of self-interest, resigned and patient, listened to the cry of the blind children of North East India. She, with her councilors responded positively. Sisters were sent for training to take care of the visually impaired children and opened a residential school exclusively for visually impaired children, in Narangi, Guwahati. Children came from northeastern states of India - Assam,Arunachalpradesh, Manipur, Meghalaya,Nagaland and Tripura irrespective of caste creed and religion. Sisters are specialized in training and teaching the Visually Impaired Children and adult. At present there are 48 students between the ages of 3 and 15 years, both boys and girls. The school follows the CBSE syllabus, and the medium of instruction is English. The students are taught Braille, Computer and the other subjects up to Class V. They are sent to Montfort schoolat 10th mile for their further studies. They are also taught music and craft and given special training for orientation and mobility. The main aim of the institution is to make the visually impaired children independent, self-sufficient and prepare them to become useful citizens of the society. Children are given ample opportunities to develop their skills both in curricular and extracurricular activities and they excel in everything. Jyothinikethan is growing steadily with all its faithfulness and hospitality to the people of that locality. Anyone who steps into jyothinikethan goes out with a heart full of joy and mindful of cherishing memories. Students have brought laurels to jyothinikethan through their outstanding performance; and this sacred institution is well known to the whole of Guwahati diocese as well as the other dioceses of North East India. Acknowledging the committed service of the sisters, Sr.ShyniKapiarumalayil is awarded with the best teacher award for the visually impaired children by the united international mission. Inorder to support Jyothinikethan financially, we started a nursery school adjacent to it. Sisters are rendering their service in MSFS School, FAsCE India (Fransalian agency for Social care and Education) and are engaged in pastoral ministry, prison ministry, tour the villages and visit families for faith formation. As we look down the memory lane of joys and struggles to gather together both pleasant and unpleasant events in order to re-capture the dreams and desires victories and failures, sweat and toil, hardships and hurdles can never be forgotten.Many hands, minds and hearts struggle greatly for the actualization of our dream. As we raise our hearts in praise to God, we bow our head in gratitude to all our benefactors and well-wishers who contributed generously in kind and person, prayer and views. We thank the students who are the light and joy ofJyothinikethan. I the Lord of sea and sky, I have heard my people cry, All who dwell in dark and sin, my hand will save…….who will bear my light to them? whom shall I send? Responding to this invitation of the Lord, the provincial administration under the leadership of Rev.Sr. Brigit Vadakkepurackal the then Provincial Superior together with the discernment of Mother Piera Silvestrini, accompanied by four vibrant and young Venerini sisters moved forward, like David the courageous King, to one of the remotest villages – Rongbonghat – of karbi Anglong district. The village was totally cut away from the township. There wasn’t proper roads, transportation, electricity, telephone services, post office, medical services or any other communication facility. The area was surrounded by streams, thick forest with wild animals, high mountains and deadly diseases. Rongbonghat mission was like a leap into the dark with eyes blindfolded. It was the dream of the catholic community in Rongbonghat to have the presence of sisters in their locality. The dream of the community was fulfilled in 1999 when these enthusiastic sisters walked into their courtyard. Sisters stayed in a bamboo hut made by the villagers for a few years. The infancy stage of the mission was life-risky. Tigers, leopards and elephants moved around the bamboo hut at night. Many at times the bamboo hut was taken away by the stormy wind in the rainy season, but the kind-hearted people were at our rescue to build it up again. It took no time for us to read the people and their need. Sisters rendered their service in the field of education, medical care and assistance, catechism in the villages, family apostolate etc… Having no infrastructure classes were held under the tree and in bamboo huts. People affected with cerebral malaria and its consequences were to be treated with extreme care and medical facilities, children with malnutrition were to be given utmost care. People were supported with lot of projects for better cultivation, adult literacy program, vocational training for young girls and awareness program of health and hygiene. We experienced a joy in all these activities though we lived with minimum facilities. During the day the Lord provided us the bright light of the sun and at night we managed with the light of a little lantern. Some plant the seed and others water, but God gives the growth. In this special occasion of the Indian province, it is indeed a matter of joy for us to share with you all that now we reap a good harvest of joy because the hard work of the pioneers produces fruits in abundance. At present we have a convent to stay, the diocese has built a good school for the students to have their education and a parish and priest to take care of our spiritual need. We gratefully remember all our benefactors such as spiritual, financial especially the priests and sisters who visited us often with words of encouragement. The villagers are in good appreciation for the good work done by the sisters in love of them. Lord of all goodness, Lord of all joy, we bow before Thee! We offer you all that we are and we have, let your light lead us forward. At the invitation of Montfort Brothers in 10th Mile, Guwahati, we opened a community in a house provided by the Brothers adjacent to the school in 2005. The purpose is to take care of the students who are differently abled – the blind, deaf and dumb – and to take care of the hostel for girls’ run by the Brothers. Students who come from the whole of North-east to do their schooling in Montfort School is given accommodation in the hostel. We share the educational ministry of Brothers, especially of the visually impaired children. Silonijan is the second site of Venerini mission in Diphu diocese in Karbi Angolong district. It was in 2006, with the prudent discernment of Rev. Sr. Brigit Vadakkepurackal the then provincial superior and her council, three young venerini sisters accommodated themselves in a classroom of the school building which belonged to silonijan parish. The area is surrounded by streams, forest and often visited by wild elephants and foxes. Maestre Pie Venerini who are brought up in the charism “Educate to set free” gave utmost importance to education of the growing generation with an aim to provide character formation as well as human formation which will contribute them to the making of citizens who will be assets to the nation. Students are to be encouraged to make sound moral judgment based on a well formed conscience to put them into practice. To inculcate these values in their learning process we had to begin from the grass-root level, yet because of the simplicity of their heart it was easy for us to begin. Since it was a malaria prone area, people were often attacked by malaria and so in order to attend to their need we opened a village dispensary for them. It did a lot of good to them and many were saved from the deadly sickness. Sisters visited the villages near and far conducting seminar and classes on health and hygiene, preventive measures of malaria and so on. In 2008, the diocese of Diphu constructed a convent for the sisters to stay and we could do our mission more conveniently. The committed effort of the pioneering missionaries are rewarded with splendid joy and contentment. We join our hands and hearts together in gratitude to God Almighty for His miraculous intervention in our life and the life of the people around. Langmili is a small Karbi village which belongs to Diphu diocese with good catholic population and only a few kilometers away from Silonijan community. Earlier the mission was looked after by another religious congregation but because of the constant malaria attack they left the mission. At the request of the Bishop, the then provincial Rev.Sr.Theresa Chandy with the support of her council agreed to look after the mission. Two sisters from Silonijan community were sent to take care of the education of the students and to have a study of the place. Though they were attacked by malaria, sisters continued their service, and in 2009 they started to stay there in a temporary house built by the diocese. The pioneers were to fight against malaria, and a lot of inconveniences. There wasn’t proper conveyance, electricity or any other communication facilities in the beginning stage. They were even deprived of the daily Eucharistic celebration. Of all these limitations the missionaries experienced the powerful protection of the Lord whose providence accompanied them all through. Now the mission is developed and the students have a full-fledged school with good infrastructure and the sisters have a convent to stay. Foreseeing the urgent need of the place we offered a dispensary in a bamboo shed for the villagers which saved a lot of life from the attack of malaria, typhoid and deadly sickness. The spirit of Christ is the spirit of mission, and the nearer we get to Him the more fervent missionary we become.